The end of November and the beginning of December fill our newsfeed with bad news. Topping the list would be the deaths of Paul Walker, the forty-year-old movie star of Fast and Furious and South African activist leader Nelson Mandela. Soon enough, all the typical Facebook memes come out (see above). 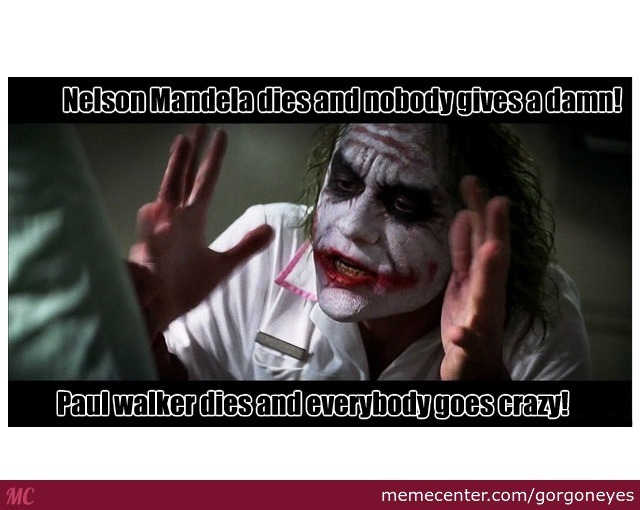 These tiresome memes repeat themselves whenever some famous person dies. The memes typically have the following logic. 1) An actor dies and everyone mourns. Lots of starving children die and no one cares. 2) An actor dies and everyone mourns, but no one cares about someone more important like Nelson Mandela. 3) An actor dies and everyone mourns. So what? We all die sometime. On the surface, all these memes make sense and appeal to the sense of justice in all of us, but in reality, they actually appeal to our sense of self-righteousness. Remember, self-righteousness is not limited to religious people only. I’ve seen plenty of such self-righteous atheists in the mix also. First and foremost, I think it’s immoral to moralize over dead people even before their bodies cool. I have already addressed this issue of moralizing over someone’s funeral in a different post. Besides the timing, I think we would do well to honor the dead for what they’ve accomplished and how their good work continues to inspire further good work. In this blog, I’m going to decry moralizing logic typically suggested by the above list. For those who care more about the starving children in Africa, I wonder if they realize that Walker was trying to do some good when his friend crashed the car. He was trying to raise money for typhoon relief in the Philippines. People mourn about Walker because they know about him. The dichotomy of the mourning ritual shows that somehow mourning over the starving children is more righteous than mourning a celebrity who tries to do some good. I admit that I’ve (sadly) never been aware of Walker’s charity work until he died. When I combed through his website, I can see that he’s involved in many charities from helping Chile to Haiti to many other worthy causes. Our society has come to the place where it can freely point its finger at the rich and say, “I expect you to give.” While we may expect the rich to be “better people”, I have news for you. They don’t have to be better people. People are people, whether they are rich or poor. People are imperfect, with some being more imperfect than others. None of us is exempt from imperfection. At the same time, as people on the same imperfect footing, rich or poor, every life is precious. We should not put a false dichotomy between the death of Walker and the starving children. One thing bothers me a bit more. It’s the comparison between Walker and Mandela. We like to either idealize our idols or disparage both. I propose that most of us do not have first-hand contact with these two men. Even if we did, we probably didn’t become close friends to them. The real Walker or Mandela is a lot more complex than these plastic placards we put up. However, before we point finger, we ought to check their public record. At least, their public record tells part of the story. I propose that we reserve the judgmental attitude for another day, especially for ourselves and not for others. We just don’t know the real historical Walker or Mandela. As such, I think we should celebrate the bit of good they did. Comparison drawn between Walker and Mandela is a moot point. Walker was not born in South Africa. There’s no way he could have done what Mandela did. Neither was Mandela born in the US. The two men did their lot in life to make a difference in this world. I think that should be our focus. The more important point though is whether publicity for doing good is as important as many of such memes seem to indicate. Sure, there’re loads of people who are unknown but are doing a lot of good. This should not prevent us from celebrating the good work both men did. So what if those others who are doing good are not known. It is not the fault of Walker. Who says good works should always be “up-worthy”? Who says fame is the ultimate reward or expression of good works? I think our value has become more and more influenced by the publicity machine in the media that somehow we think that we’re all competing for the spotlight while doing good. In reality, doing some good is already enough. Publicity is an afterthought and a possible byproduct but certainly not an expectation for doing good. The bottom line is this. Famous people are not better or worse. They’re just famous, but if they have done a lot of good like either Walker or Mandela, there’s nothing wrong with celebrating their lives. Since life is precious, I don’t think it is a requirement for the deceased to do a huge amount of good in order for someone to care. We certainly don’t yell, “So what? Everyone dies!” at funerals. That goes for both Walker-Mandela or the starving children. Death is not the place to make self-righteous judgment against others. Th real question is whether each of us is doing our lot in making this world a better place. Walker did his part. So did Mandela. What are we doing for the starving children? What are we doing for the injustices of this world? Those are the questions we should be asking instead of making impossible comparisons. St. Paul was right when he wrote, “Let us not become weary in doing good, for at the proper time, we will reap a harvest if we do not give up.” The best way to honor the good works of these two famous people is to follow St. Paul’s biblical advice.